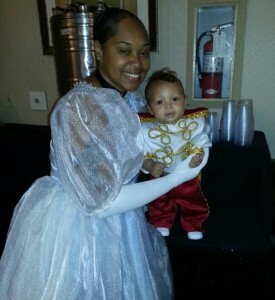 AV Spotlight: Charles Ross the pageant prince! 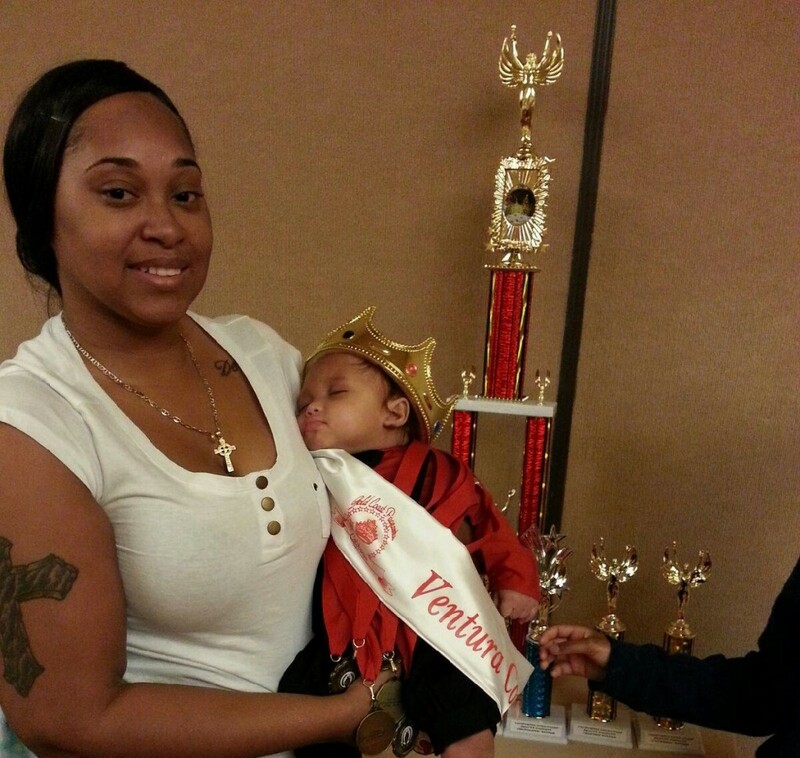 Palmdale resident Charles Ross (with mom Meon Ross) takes a power nap after clinching victory at a pageant. The five-month-old already has two dozen trophies to his credit. PALMDALE – Born with a unique look, Charles Peter Ross III is starting out life with a bang. With a total of 24 trophies, 10 medals, two sashes, two picture plaques, and one crown, this five-month-old Palmdale resident has what it takes to show the world he’s one of a kind. Charles holds the title of Mr. Infant Supreme for California Tropic, as well as supreme titles with Gold Coast, and plans on competing in the Tri-State Nationals in April, 2013. Ross says Charles does a great job on stage, as babies tend to go first in the pageants. This gives his mother a chance to show him off with minimal fussing. Mom, a self-proclaimed fashionista, buys all her son’s costumes from Daisy’s Costumes on the BLVD. Ross started entering Charles into pageants due to all of the attention received by the public. A Warner Bros. employee stopped her one day and recommended doing something due to his distinctive look. His first pageant took place in Ontario in February 2013. Every pageant Charles has participated in has put him in the running to attend state and national competitions. He has competed in pageants run by Gold Coast and California Tropic. 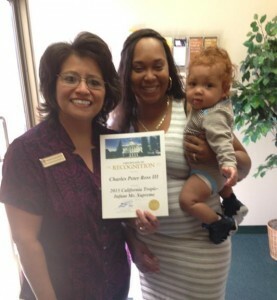 Baby on the move: Charles recently received a certificate of recognition from Assemblyman Steve Fox. Charles was signed by a talent agency in February 2013. Assemblyman Steve Fox provided him a certificate of recognition. Ross says her family is very encouraging, “My family thinks it is a great thing for him to do pageants. They support him 100%,” she said. 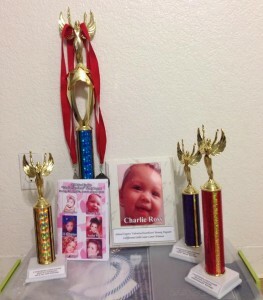 Charles has received awards in numerous categories, including Best Hair, Best Eyes, Best Smile, Swim Suit, Personality, Tiny Baby Boy, and Youngest Baby. 7 comments for "AV Spotlight: Charles Ross the pageant prince!" Congrats to you and your beautiful son! I’m a former beauty queen winner and trust me it can very well take him a long way. Look at Honey Boo Boo and she is not at all as gorgeous as him! My child also participated over 20 years ago and in all won over 858 trophies,awards and savings bonds along with toys. He developed confidence,poise and ability the to present himself before the public. He enjoyed performing in talent categories. OOOOOOHHHH Goodness, he is going to be a Heart Breaker, How cute is he, lok at those legs, just wanna get them lol,… But I wont.. and Congrats to the Mom, I love how she gets into it and dresses up with him..
Don’t take it personal Mimi. Some trolls do it just because they can.